<center><span style="color:#576f91; font-family:georgia, serif; align: center; font-weight:bold; margin-bottom: 125px;">The iGEM 2010 Jamboree will take place on November 6th to November 8th, 2010 at MIT in Cambridge, MA. In order to provide others with a summary of what your project is about, we will be asking each iGEM team to submit an abstract of 100-150 words by September 20th. Your abstract will be used in the Jamboree program that will provide a guide to the different topics that iGEM teams will be presenting. Please see the [[Jamboree/Project_abstract | project abstract]] page for more details. In order to provide others with a summary of what your project is about, we will be asking each iGEM team to submit an abstract of 100-150 words along with your project title (maximum 15 words) by September 20th. Your abstract will be used in the Jamboree program that will provide a guide to the different topics that iGEM teams will be presenting. Please see the [[Jamboree/Project_abstract | project abstract]] page for more details. iGEM teams are expected to submit their parts to the [http://partsregistry.org Registry of Standard Biological Parts]. There have been changes to the submission process this year, namely pSB1C3 as a standard backbone for submissions, so please take a look at the submissions page linked below. In addition to submitting your parts, you must also declare which of you parts are you "favorites." Judges will only be looking at favorite parts so make sure to promote them before the October 27th deadline. iGEM teams are expected to submit their parts to the [http://partsregistry.org Registry of Standard Biological Parts]. There have been changes to the submission process this year, namely pSB1C3 as a standard backbone for submissions, so please take a look at the submissions page linked below. In addition to submitting your parts, you must also declare which of your parts are "favorites." Judges will only be looking at favorite parts so make sure to promote them before the October 27th deadline. See the [[DNA_Submission | DNA submission requirements]] for more information about the DNA submission process. Teams will be required to submit a judging form that outlines their accomplishments according to the judging criteria. Judging forms will be available online at the beginning of October, and will be due on October 27th. iGEM 2010 team wikis will be frozen on [[Calendar_of_Events | Wednesday, October 27 at 11:59 EDT]]. See the [[Jamboree/Wiki_Freeze | wiki freeze page]] for more details. Welcome to the iGEM 2010 Jamboree! The next few days will be full of exciting presentations, stimulating conversations, well-deserved awards, and most of all, a lot of fun. The following information will guide you through the whole Jamboree event from what to expect at Friday night practice all the way up to the awards ceremony on Monday. Please read through this whole guide! It contains useful instructions and information that will ensure your Jamboree experience will go as smoothly as possible. And as a special note to [[Jamboree#Team_Leaders | team leaders]], you will have some extra responsibilities so please make sure you are aware of what you are expected to do. Welcome to the iGEM 2010 Jamboree! The next few days will be full of exciting presentations, stimulating conversations, well-deserved awards, and most of all, a lot of fun. The following information will guide you through the whole Jamboree event from what to expect at [[Jamboree#Friday_Night_Practice | Friday night practice]] all the way up to the [[Jamboree#Awards_Ceremony | awards ceremony]] on Monday. Please read through this whole guide! It contains useful instructions and information that will ensure your Jamboree experience will go as smoothly as possible. And as a special note to [[Jamboree#Team_Leaders | team leaders]], you will have some extra responsibilities so please make sure you are aware of what you are expected to do. '''Note:''' For all locations on the MIT campus – Stata Center, Lobby 13, Walker Memorial, and other event locations, consult the [[Jamboree/Campus_map | map]] in your registration packet. If you have a question or need help at any point during the Jamboree, you can visit the information center at Compton Lounge, the iGEM Headquarters table in the Stata Center, or look for one of the iGEM staff members on site. We've prepared our general [[Jamboree/Schedule | schedule]] and a more detailed one will be posted closer to the Jamboree. Teams can check-in on Friday afternoon (November 5th) for the Jamboree beginning at 1pm. Registration will be located at Compton Lounge. At Registration you will pick up your [[Jamboree#Team_Boxes | team box]] containing team member badges, participation certificates, registration packets, lunch tickets, and other important and useful information. Each [[Jamboree#Team_Leaders | team leader]] will be responsible for picking up the team box. This means that each member of the team DOES NOT have to stand in line at Registration. Important: in order to pick up your team box, you will be required to turn in all general release forms for each person that is on your team roster. The release forms are absolutely necessary (see section on release forms below). Registration personnel will check off each release form for each team member. Badge(s) pertaining to each person missing a release form will be held at Registration until the form has been turned in. [[Jamboree#Badges | Badges]] will be necessary for entrance into presentation rooms, events, and for access to food. Guests can check-in on Friday (November 5th) at 1pm, also at Compton Lounge. If you did not register online, it will be possible to register on-site during the course of the Jamboree. Registration at this time will cost $275 for undergraduates and high school students, and $475 for everyone else. On Monday, however, on-site registration will take place at Kresge Auditorium. At Check-in you will pick up your [[Jamboree#Team_Boxes | team box]] containing team member badges, participation certificates, registration packets, lunch tickets, and other important and useful information. Each [[Jamboree#Team_Leaders | team leader]] will be responsible for picking up the team box. This means that each member of the team DOES NOT have to stand in line at check-in. '''Important:''' in order to pick up your team box, you will be required to turn in all general release forms for each person that is on your team roster. The release forms are absolutely necessary (see section on release forms below). Check-in personnel will check off each release form for each team member. Badge(s) pertaining to each person missing a release form will be held at Check-in until the form has been turned in. Badges will be necessary for entrance into presentation rooms, events, and for access to food. You will receive your name badge as part of your [[Jamboree#Team_Boxes | team box]], as long as you have submitted your general release form. Please wear your badge at all times during the Jamboree and make sure it is clearly visible. Badges will be necessary for entrance into presentation rooms, for access to food, and for the iGEM social event. If you do not have a badge, you must register in order to obtain one. You will receive your name badge as part of your [[Jamboree#Team_Boxes | team box]], as long as you have submitted your general release form. Please wear your badge at all times during the Jamboree and make sure it is clearly visible. Badges will be necessary for entrance into presentation rooms, for access to food, and for the [[Jamboree#Social_Event:_Sunday_Night | iGEM social event]]. If you do not have a badge, you must register in order to obtain one. The 2010 iGEM Jamboree will be a multimedia event: in addition to the team presentation videos that will be uploaded online, we will also be uploading photos and videos from the entire event so others can get an idea of what iGEM and the Jamboree is like. In order to comply with the law, all participants attending the Jamboree must print, fill out, and bring a [[Jamboree/Release_form | general release form]] with you to the Jamboree. '''Note:''' Team leaders, you must have a filled-out general release form for each member of your team that is on the official roster before you can pick up your team member badges and team box. There will also be blank copies available at registration for you to fill out if you need another copy. If you have any questions or need further clarification, feel free to ask an iGEM staff member (in the black iGEM pullovers). The 2010 iGEM Jamboree will be a multimedia event: in addition to the team presentation videos that will be uploaded online, we will also be uploading photos and videos from the entire event so others can get an idea of what iGEM and the Jamboree is like. In order to comply with the law, all participants attending the Jamboree must print, fill out, and bring a [[Jamboree/Release_form | general release form]] with them to the Jamboree. Note: [[Jamboree#Team_Leaders | Team leaders]], you must have a filled-out general release form for each member of your team that is on the official roster before you can pick up your team member badges and [[Jamboree#Team_Box | team box]]. There will also be blank copies available at registration for you to fill out if you need another copy. If you have any questions or need further clarification, feel free to ask an iGEM staff member. Go to the [[Jamboree/Release_form | Release form page]] for an online and pdf version of the form. As mentioned above, team leaders have a few responsibilities. Each team leader (or a designated representative) will be responsible for gathering all team member general release forms and handing them in at [[Jamboree#Registration/Check-In | Check-in]] in order to obtain your team box. Team leaders are responsible for making sure individual team members receive the materials in the box. On Monday at Kresge Auditorium, team leaders will pickup their team medals after the [[Jamboree#Awards_Ceremony | awards ceremony]]. '''Notes:''' Team leaders are responsible for picking up team boxes and ensuring individual team members receive the necessary materials. Badges are to be worn at all times. '''Notes:''' Team leaders are responsible for picking up team boxes and ensuring individual team members receive the necessary materials. [[Jamboree#Badged | Badges]] are to be worn at all times. At the Jamboree you will be representing your team, university, and country, so why not [[Jamboree/Team_Spirit | show off]]! Designing team t-shirts is always a good idea, and here at iGEM HQ we encourage you to wear them. They also make for a particularly nice [[Jamboree#iGEM_from_Above | iGEM from Above]] photograph as well. Wear your school colors, your team's name, or give a nod to your team's sponsors. We also encourage you to find new ways to showcase your team spirit. Teams will be allowed to practice on Friday night (November 5th) at MIT, beginning at 6:00pm. You can practice your presentation, and get to know fellow iGEM members. There are a limited number of rooms available, so please sign up online on the [[Jamboree/Schedule/Practice_Sessions | Practice sessions]] page to reserve your time-slot. Practice sessions will run from 6:00pm to 10:00pm, and there will also be pizza and soda provided on a first come, first serve basis. We cannot match the practice room with the room that you will give your presentation in on Saturday or Sunday. '''Note:''' there will not be technical staff on hand to help with audio/visual equipment. Please leave all presentation rooms in the condition that you found them. The Saturday Opening Ceremony will officially kick off the 2010 Jamboree! The opening ceremony will be held at Kresge Auditorium at 9:00am on November 6th, with breakfast starting at 8:00am. Be sure to attend as we will also update you with any new changes to the Jamboree and the events planned for the next few days. Due to the size of this year’s Jamboree, we have established three main hubs on the [[Jamboree/Campus_map | MIT campus]] – the Stata Center, Lobby 13, and Walker Memorial. These hubs have been randomly assigned tracks to house during the course of the Jamboree. Hubs will have poster locations and associated presentation rooms according to their assigned track. All hubs will have locations that serve food during the Jamboree. Check your team box for information on where you should setup your poster, pick up lunch, and present. Trying to find someone at the Jamboree? Want to leave some words of praise for your fellow iGEMers? Each hub has a message board so that you can leave a note for a team or one of their members. The message board has the names of all the teams stationed in that hub, and there is room for you to post a note right below their name. Pens, paper and push pins are available at the message board. All teams should check their hub’s message board throughout the Jamboree. There may be an funny, interesting, or important message waiting for you! Food will be provided throughout the Jamboree. There will be lunch stations at all three hubs: Stata Center, Lobby 13, Walker Memorial. Your [[Jamboree#Team_Boxes | team box]] will contain lunch tickets, color-coded for your assigned station, which will be used to pickup your lunch. Badges must be (visibly) worn in order to have access to all food. Teams have been randomly assigned to lunch stations in order to spread out the crowd and cut down on the time you have to wait on line. We ask that you please pick up your lunch in your assigned station, although you are free to eat it where you wish. Specially requested meals: vegan, and gluten-free, will be served at Compton Lounge. See the flyer in your registration folder for the menu and your lunch location. Each team is required to present a poster at the Jamboree. There are two poster sessions, session ‘A’ on Saturday and session ‘B’ on Sunday, and your team has been randomly assigned to ONE session. Furthermore, poster locations have been randomly assigned according to track in one of the three main hubs: Stata Center, Lobby 13, Walker Memorial. Please see your poster information sheet, in your [[Jamboree#Team_Boxes | team box]], for your team’s specific poster session and location. Clear push pins will be provided at the poster stands and are to be affixed to each poster board. Please only use these clear push pins. Do not use tape or the grey pins along the edge of the board. The grey pins hold the poster board onto the frame, and if they are removed, the board will fall. Teams can setup their posters beginning at 8am on Saturday or Sunday depending on their session assignment. Poster judges will be roaming throughout the day Saturday and Sunday. <span style="text-decoration: line-through;">A green sticker affixed to your poster will indicate that it has been judged</span>. The poster receptions will be held on Saturday and Sunday from 5pm and 7pm in Stata Center, Lobby 13, and Walker Memorial. This year there are a total of six presentation rooms located across the campus. Presentation rooms are associated with one of the three hubs: Stata Center, Lobby 13, Walker Memorial, and therefore will also be separated by track. Your team’s scheduled presentation time, slot, session, and room have all been randomly assigned within your track. Please see your [[Jamboree#Team_Boxes | team box]] for information on when and where your team will be presenting. In each room, the presentations will be divided into sessions with each session comprised of three separate presentations. Each of the three presentations given during a session will be of the same ‘track’. If you are attending the presentations, please stay for the whole session and only leave the room during the scheduled breaks. Each team has 20 minutes of presentation time, 5 minutes for questions and answers, and 5 minute to switch with the next presenters. Please be sure to bring the necessary equipment for your presentation, such as your laptop, cables/adaptors, and power supply, as iGEM will not provide these. After Saturday's poster reception, there will be workshops to discuss iGEM 2011 regions, as well as workshops held by sponsors. More details will be provided at the Opening Ceremony on Saturday. Check the [[Jamboree/Schedule | schedule]] for workshop times, locations, and topics. On Sunday night after the poster reception, we will be hosting the iGEM 2010 Jamboree [[Jamboree/Social_Event | Social Event]] at [http://www.jilliansboston.com/ Jillian’s of Boston] from 9:00pm to 1:00am. There will be food, dancing, billiards, bowling, lounge space on the 1st and 2nd floors of Jillian's. Each person will receive two drink tickets at the door for soft drinks/soda. After two full days of presentations, the Jamboree Social Event will be a welcome change, so we highly encourage all iGEM participants to attend attend. Relax and have fun! For those who are 21 and over there will be a cash bar. The drinking age in the US is 21 so please keep this in mind. Bartenders will be checking IDs so please have your US ID or passport with you as identification. Underage drinking activity will get you kicked out by Jillian's staff from the social event, so please don't have a friend buy you alcohol. Check out the [[Judging/Judging_Criteria | Judging Criteria]] page for the requirements for each medal level. We have arranged to have shuttle buses to bring people from the MIT campus and the Hyatt to the event location at Jillian's in the Fenway area of Boston. See the [[Jamboree/Campus_map | map]] in your registration packet for shuttle stop locations and times. '''Note:''' You must have your iGEM name [[Jamboree#Badges | badge]] in order to gain access to the social event. [[Judging/Awards | Awards]] will be presented at the awards ceremony on Monday (November 8th). Each team that wins an award will receive one trophy for the team as well as award certificates for each team member. These award certificates are separate from the participation certificates that all iGEM teams receive from their team box. Both the award certificates and the participation certificates look great when framed. Certificate frames will be provided by iGEM HQ and will be available in the lobby of Kresge Auditorium after the awards ceremony finishes. Boxes for the awards will also be provided at this time. The awards ceremony will be held on Monday at Kresge Auditorium and will start at 9:00am, with breakfast starting at 8:30am. The judges will announce the six finalists, who will then be asked to give their presentations again. All teams should be prepared to present at Kresge, so be sure to bring the necessary materials with you. After the finalists have given their presentations, the judges will deliberate and the iGEM from Above picture will be taken! Finally, the award winners will be announced and the 2010 Jamboree will officially end! Note: For guest attendees, entrance to the awards ceremony is not guaranteed, and is dependent on the capacity of Kresge Auditorium. Family and friends are welcome to [[Jamboree/Attendance_Fee | register]] for all iGEM Jamboree events. If non-iGEM team members (e.g. family, friends, guests) want to attend the presentation sessions, poster sessions, social on Sunday, and the awards ceremony, they have to officially register and get a badge (on-site registration is available and can be paid for with all major credit cards, US$475). Entrance to the awards ceremony is not guaranteed, and is dependent on the capacity of Kresge Auditorium. After the finalists have given their presentations on Monday, we will be taking the 2010 iGEM from Above picture! The picture will be taken at the Kresge Oval, weather permitting. Make sure to wear your [[Jamboree/Team_Spirit | iGEM team t-shirt]]! On Sunday night after the poster reception, we will be hosting an iGEM Jamboree social event at [http://www.jilliansboston.com/ Jillian’s of Boston] from 8:00pm to 12:00am. There will be food, dancing, billiards, bowling, lounge space on the 1st and 2nd floors of Jillian's. Each person will receive two drink tickets at the door for soft drinks/soda. For those who are 21 and over there will be a cash bar. The drinking age in the US is 21 so please keep this in mind. Bartenders will be checking IDs so please have your US ID or passport with you as identification. We have arranged to have shuttle buses to bring people from the MIT campus and the Hyatt to the event location at Jillian's in the Fenway area of Boston. See the map in your registration packet for shuttle stop locations. '''Note:''' You must have your iGEM name badge in order to gain access to the social event. [[Judging/Awards | Awards]] will be presented at the [[Jamboree#Awards_Ceremony | awards ceremony]] on Monday (November 8th). Each team that wins an award will receive one trophy for the team as well as award certificates for each team member. These award certificates are separate from the participation certificates that all iGEM teams receive from their team box. Both the award certificates and the participation certificates look great when framed. Certificate frames will be provided by iGEM HQ and will be available in the lobby of Kresge Auditorium after the awards ceremony finishes. Boxes for the awards will also be provided at this time. Family and friends are welcome to [[Jamboree/Attendance_Fee | register]] for all iGEM Jamboree events. If non-iGEM team members (e.g. family, friends, guests) want to attend the presentation sessions, poster sessions, social on Sunday, and the awards ceremony, they have to officially register and get a badge (on-site registration is available and can be paid for with all major credit cards, US$475). Entrance to the [[Jamboree#Awards_Ceremony | awards ceremony]] is not guaranteed, and is dependent on the capacity of Kresge Auditorium. If you need to check out of your hotel on Monday morning and need to stow your luggage somewhere, you can bring it to Kresge Auditorium. However, we cannot guarantee that it will be locked or supervised during the awards ceremony. Luggage can only remain at Kresge half an hour after the [[Jamboree#Awards_Ceremony | awards ceremony]] ends, so it is absolutely critical that your luggage be picked up by that time. See [http://web.mit.edu/facilities/transportation/shuttles/index.html MIT's Shuttle website] for more information. There will be many big changes ahead for iGEM, and one of the biggest will be the move to regional competitions. In 2011 iGEM teams will compete according to their specific region and then the teams that are selected from their regional competitions will go on to the worldwide competition held at MIT. We will be explaining the changes to iGEM at the 2010 Jamboree and more information will be provided online at 2011.igem.org. iGEM 2010 results will be announced at the Jamboree awards ceremony on Monday November 8th. See the [http://igem.org/Results?year=2010 Results] page for a summary of who won at the iGEM 2010 Jamboree. If you have any online articles about your team or iGEM that you would like to share, please post them on the [[IGEM_Publicity| Publicity page]]. For the iGEM boilerplate, high-resolution logos, and more material for the press, please see the [[Press_Kit | press kit]] page. For the iGEM boilerplate, high-resolution logos, and more material for the press, please see the [http://igem.org/Press_Kit press kit] page. We will be posting information about [http://2011.igem.org iGEM 2011] soon after the Jamboree so make sure you check back if you are interested in participating! We are looking for volunteers to help us put together the iGEM Alumni Association. Interested? Contact [[User:Meagan | Meagan]]. After the Jamboree, iGEM competition teams will begin to dissolve and go back to "normal" life. That doesn't mean you need to stop working on Synthetic Biology based on parts. Have your PI join iGEM as an iGEM lab to get all of the same resources as the competition teams: parts, online wiki space, etc. See [http://igem.org igem.org] for details on how to create a lab group. Show off you team spirit! Leave a note for a team! In order to provide others with a summary of what your project is about, we will be asking each iGEM team to submit an abstract of 100-150 words along with your project title (maximum 15 words) by September 20th. Your abstract will be used in the Jamboree program that will provide a guide to the different topics that iGEM teams will be presenting. Please see the project abstract page for more details. iGEM teams are expected to submit their parts to the Registry of Standard Biological Parts. There have been changes to the submission process this year, namely pSB1C3 as a standard backbone for submissions, so please take a look at the submissions page linked below. In addition to submitting your parts, you must also declare which of your parts are "favorites." Judges will only be looking at favorite parts so make sure to promote them before the October 27th deadline. iGEM 2010 team wikis will be frozen on Wednesday, October 27 at 11:59 EDT. See the wiki freeze page for more details. Note: For all locations on the MIT campus – Stata Center, Lobby 13, Walker Memorial, and other event locations, consult the map in your registration packet. We've prepared our general schedule and a more detailed one will be posted closer to the Jamboree. At Registration you will pick up your team box containing team member badges, participation certificates, registration packets, lunch tickets, and other important and useful information. Each team leader will be responsible for picking up the team box. This means that each member of the team DOES NOT have to stand in line at Registration. Important: in order to pick up your team box, you will be required to turn in all general release forms for each person that is on your team roster. The release forms are absolutely necessary (see section on release forms below). Registration personnel will check off each release form for each team member. Badge(s) pertaining to each person missing a release form will be held at Registration until the form has been turned in. Badges will be necessary for entrance into presentation rooms, events, and for access to food. The 2010 iGEM Jamboree will be a multimedia event: in addition to the team presentation videos that will be uploaded online, we will also be uploading photos and videos from the entire event so others can get an idea of what iGEM and the Jamboree is like. In order to comply with the law, all participants attending the Jamboree must print, fill out, and bring a general release form with them to the Jamboree. Note: Team leaders, you must have a filled-out general release form for each member of your team that is on the official roster before you can pick up your team member badges and team box. There will also be blank copies available at registration for you to fill out if you need another copy. If you have any questions or need further clarification, feel free to ask an iGEM staff member. As mentioned above, team leaders have a few responsibilities. Each team leader (or a designated representative) will be responsible for gathering all team member general release forms and handing them in at Check-in in order to obtain your team box. Team leaders are responsible for making sure individual team members receive the materials in the box. On Monday at Kresge Auditorium, team leaders will pickup their team medals after the awards ceremony. At the Jamboree you will be representing your team, university, and country, so why not show off! Designing team t-shirts is always a good idea, and here at iGEM HQ we encourage you to wear them. They also make for a particularly nice iGEM from Above photograph as well. Wear your school colors, your team's name, or give a nod to your team's sponsors. We also encourage you to find new ways to showcase your team spirit. Teams will be allowed to practice on Friday night (November 5th) at MIT, beginning at 6:00pm. You can practice your presentation, and get to know fellow iGEM members. There are a limited number of rooms available, so please sign up online on the Practice sessions page to reserve your time-slot. Practice sessions will run from 6:00pm to 10:00pm, and there will also be pizza and soda provided on a first come, first serve basis. We cannot match the practice room with the room that you will give your presentation in on Saturday or Sunday. Note: there will not be technical staff on hand to help with audio/visual equipment. Please leave all presentation rooms in the condition that you found them. Due to the size of this year’s Jamboree, we have established three main hubs on the MIT campus – the Stata Center, Lobby 13, and Walker Memorial. These hubs have been randomly assigned tracks to house during the course of the Jamboree. Hubs will have poster locations and associated presentation rooms according to their assigned track. All hubs will have locations that serve food during the Jamboree. Check your team box for information on where you should setup your poster, pick up lunch, and present. Food will be provided throughout the Jamboree. There will be lunch stations at all three hubs: Stata Center, Lobby 13, Walker Memorial. Your team box will contain lunch tickets, color-coded for your assigned station, which will be used to pickup your lunch. Badges must be (visibly) worn in order to have access to all food. Each team is required to present a poster at the Jamboree. There are two poster sessions, session ‘A’ on Saturday and session ‘B’ on Sunday, and your team has been randomly assigned to ONE session. Furthermore, poster locations have been randomly assigned according to track in one of the three main hubs: Stata Center, Lobby 13, Walker Memorial. Please see your poster information sheet, in your team box, for your team’s specific poster session and location. Poster judges will be roaming throughout the day Saturday and Sunday. A green sticker affixed to your poster will indicate that it has been judged. The poster receptions will be held on Saturday and Sunday from 5pm and 7pm in Stata Center, Lobby 13, and Walker Memorial. This year there are a total of six presentation rooms located across the campus. Presentation rooms are associated with one of the three hubs: Stata Center, Lobby 13, Walker Memorial, and therefore will also be separated by track. Your team’s scheduled presentation time, slot, session, and room have all been randomly assigned within your track. Please see your team box for information on when and where your team will be presenting. After Saturday's poster reception, there will be workshops to discuss iGEM 2011 regions, as well as workshops held by sponsors. More details will be provided at the Opening Ceremony on Saturday. Check the schedule for workshop times, locations, and topics. On Sunday night after the poster reception, we will be hosting the iGEM 2010 Jamboree Social Event at Jillian’s of Boston from 9:00pm to 1:00am. There will be food, dancing, billiards, bowling, lounge space on the 1st and 2nd floors of Jillian's. Each person will receive two drink tickets at the door for soft drinks/soda. After two full days of presentations, the Jamboree Social Event will be a welcome change, so we highly encourage all iGEM participants to attend attend. Relax and have fun! We have arranged to have shuttle buses to bring people from the MIT campus and the Hyatt to the event location at Jillian's in the Fenway area of Boston. See the map in your registration packet for shuttle stop locations and times. After the finalists have given their presentations on Monday, we will be taking the 2010 iGEM from Above picture! The picture will be taken at the Kresge Oval, weather permitting. Make sure to wear your iGEM team t-shirt! If you need to check out of your hotel on Monday morning and need to stow your luggage somewhere, you can bring it to Kresge Auditorium. However, we cannot guarantee that it will be locked or supervised during the awards ceremony. Luggage can only remain at Kresge half an hour after the awards ceremony ends, so it is absolutely critical that your luggage be picked up by that time. iGEM 2010 results will be announced at the Jamboree awards ceremony on Monday November 8th. See the Results page for a summary of who won at the iGEM 2010 Jamboree. We are looking for volunteers to help us put together the iGEM Alumni Association. Interested? Contact Meagan. After the Jamboree, iGEM competition teams will begin to dissolve and go back to "normal" life. That doesn't mean you need to stop working on Synthetic Biology based on parts. Have your PI join iGEM as an iGEM lab to get all of the same resources as the competition teams: parts, online wiki space, etc. 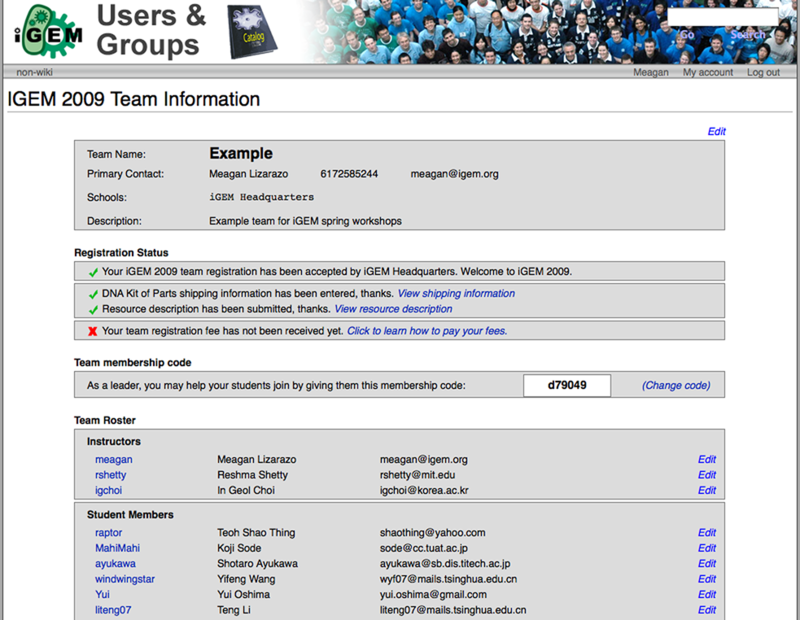 See igem.org for details on how to create a lab group.